The Cooum river means many things to us in Madras, but none are complimentary! Some may remember the filth, and others the smell. Old-timers talk about boat-rides and even baths, but it’s hard to conjure up these images seeing a dried-up or, even worse, stinking waterway. Priya Bhaskaran, based on a chat with Venkatesh Rama-krishnan, thought otherwise and over 18 months, with the members of ‘The Cooum – A Cultural Mapping Group’ traced the river’s path and the temples on its banks. What she found is now a slim volume*, seeking to inspire the reader to visit the sites armed with information. Cooum now has a good guide that none of our other rivers have! We start with the Thiruvir-kolam village which has a temple for Thirivir-kolanathar. The large tank from where the river originates has been famous from Chola times. In the 12th Century, the tank was renamed Tyagasamudra-nallur. Nallur here indicates a large, agriculture-based settlement. In 1057 CE, the tank was called Tribhuvanmahdevi Pereri and a feeder canal was dug into it. In 1112, the temple took fishing and paddy taxes from the community to keep the tank in good repair. So clearly, in the time of the imperial Cholas, the tank was a large one and the Cooum must have been an important water source for all villages on its banks. The temple is older for it finds a place in the third Tirumurai of Sambandar, who is dated to the 6th Century. In his song number 23, he confines himself only to mythological incidents but does mention Buddhists and Jains. 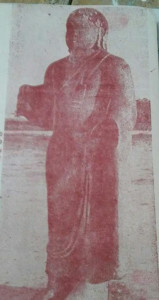 The book tells us that a sculpture of Buddha was discovered here and is held at present by the Government -Museum, Madras. A total of 113 temples are covered in the book. I record a few of the other important ones, The Deivanayakeswara Swamy Temple in Elumiyankottur has a unique Dakshinamurthy image with his hand on the chin mudra close to the knot on his sacred thread. An inscription here as well as in a few other temples in this area mention the role of the Chola kings in the 12-13th Century of converting brick temples into stone temples. Such inscriptions are important, since they tell us that the banks of the Cooum were an important and prosperous part of the Chola empire when it was at its height. 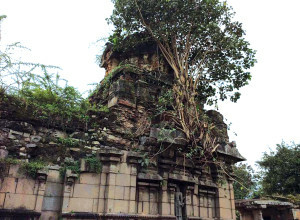 The temple at Sivapuram is built entirely out of stone and has an early inscription of Raja Raja Chola. It was called Urogadam in those days and must have been one of his earliest all-stone temples. Mappedu has a rare image of Hanuman playing the veena. Pillayarkuppam has a unique ritual called the Vetrilai Kappu, where an eight feet metal arch (Prabhavali) is stuffed with betel leaves and then taken inside and installed within the sanctum. 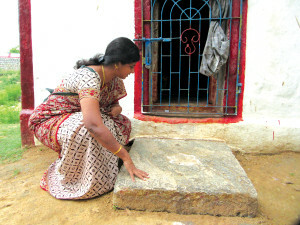 Chitrambakkam’s Selliam-man temple is important for Tamil Nadu and epigraphy.The temple has a small slab bearing the earliest evidence available for a structural temple (as opposed to a cave temple) built by the Pallavas during the first regal year of King Parameswara Varman (669-70 CE). It is to be hoped, this slab is well protected and not cemented over in a future restoration. It could have been on the wall once and is on the floor now, which means there is greater wear and tear and its only a matter of years when the writing now get completely eroded. 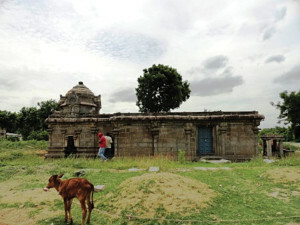 The book mentions a rare Pallava image of a seated Vishnu in Aranvoyal that also needs better protection and the Janamejayeswara temple in Cenji that is in danger of collapse soon. Temples within Madras are also covered in the book: Koyambedu, Arumbakkam, Chetpet, Kilpauk, Mount Road, Chintadripet, all find a place in it. Komaleeswaranpet, we learn that the other name for Cooum was Vriddha Ksheera – Ancient river of Milk. It has rare bronze lamps, and sculptures including one of Kannagi. The Hazrath Syed Moosa Dargah is mentioned in Mount Road. The book ends with what is probably the newest temple, the Muthu Karumari Amman temple, under Napier Bridge where the Cooum joins the Bay of Bengal. The book has short, well written notes on all aspects of the temples. Serious history lovers will find valuable epigraphical summaries of findings in each temple and lovers of mythology will find details of the sthala puranas of each temple. Most entries have a small photograph and useful information at a glance – the name of the deities, the location with a Geo tag, -timings, the name and phone number of the priest and a speciality. I hope the author and her team will soon publish the Koova Puranam as a companion volume.